For most men who are dealing with hair loss, it can be an embarrassing and stressful condition to treat. Just like women who are conditioned to believe that hair is important to social value, men are expected to have a full head of hair. Since the beginning of time, hair on a man’s body has been associated with his degree of masculinity and virility. Men also suffer from the largest degree of hair loss, accounting for 60% of reported cases. Male pattern baldness is the leading cause of hair loss for men, and successful treatment for hair loss in men tends to involve a combination of medications. It’s also more common for men to undergo cosmetic surgery for baldness. Understanding the major cause of badness in men. Genetics plays the biggest factor, over 90% of cases, in why men tend to suffer with baldness more than women. Androgenic Alopecia is the scientific name for baldness caused by androgens. What happens is that testosterone in the blood is converted into the androgen called dihydrotestosterone or DHT and for some follicles, DHT has a toxic effect on then, causing them to shrink up. The shrinking means that hair is shed and not regrown. It is not a typical reaction, and genetics in particular determine if you can have follicles that will react in this manner. Treating androgenic alopecia, especially in cases where male pattern baldness is concerned, revolves around lowering the amount of free, or excess, testosterone that can be converted into DHT and preventing it from being converted within the follicle itself. Popular hair loss treatments for men with male pattern baldness. There are a few major medications used to treat hair loss. Some can also be used by women, but all were developed for men in particular, and tend to work better for the male gender. 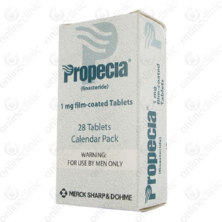 Propecia is the trade name for the drug Finasteride. It was the first pill ever approved by the FDA as a treatment for baldness. It works by blocking the conversion of testosterone into DHT inside the follicles. The best hair loss treatment for men involves combining Finasteride with a topical treatment such as minoxidil, commonly called Rogaine. The highest percentage of non surgical success involves this combination treatment. Other common treatments for baldness involve targeting other potential factors that could be causing or contributing to baldness. For men, just like women, improper diet habits can lead to hair loss or thinning. While weight loss dieting is less common in males, lack of balanced nutrition in men tends to be more common. A lot of times, simple blood work at the doctor’s office can help produce a base line to pinpoint any deficiencies or excesses in vitamin and mineral levels than can be aggravating hair loss. Simple changes to diet and adding supplements can be one way to simply help curb hair loss. Insulin levels can also affect hair loss. Excess insulin in the bloodstream can have a negative impact on hair follicles, making it harder to maintain hair growth. Those with diabetes should be especially careful about managing their condition and monitoring their glucose levels. When treating the major condition causing high insulin levels, diet and exercise tend to be vital aspects that are addressed. Like other causes, such as general nutritional imbalances the simple act of keeping a healthy diet can go a long way in fighting hair loss. While strands of hair themselves are not considered living material, the hair root very much is and requires the right nutrition and blood flow to maintain good health. Hair loss treatment for men that involve lifestyle changes. Outside of changing to a proper diet that involves proper nutritional levels, there are other aspects of general lifestyle that can be changed to help encourage good hair health. Massaging the scalp and keeping it cleaned and well groomed can go a long way to encouraging health on a topical level. Clearing excess oils with gentle cleansers and stimulating blood flow with massage are simple things that can be done as part of a regular grooming routine. One aspect of hair care and grooming that tends to be less of a problem for men is wearing your hair pulled tight. However, males tend to use more products in their hair at times than can contribute to agitation of the follicles and result in thinning hair or even scarring that leads to permanent hair loss. Smoking can have a negative impact on not just your overall health, but it can make male pattern baldness worse. Studies have shown there is a significant increase in baldness among men who smoked and those who quit or did not. Male hair loss treatment can be a tricky task at times. While researching for possible treatments can yield page after page of sites that claim to have the answer, in truth, depending on the cause, there can be no real or easy cure. The earliest record of treatments for baldness go back to almost the beginning of recorded time. Herbal remedies never carry a backing by the FDA because the clinical studies to prove them are few and far between, if they even exist at all. A lot of none working products will claim to work like prescription alternatives, but these again are falsities. At most, there are non prescription treatments that can help improve blood flow, which can stimulate hair growth. Minoxidil, known as Rogaine, is non prescription in an over the counter topical formula, and is the only one recognized as having been properly tested and proven to be effective. Any pill or cream that claims to work like or be as effective as prescription medication should be examined extensively and researched before being tried. A major alternative to creams and pills is surgery. Hair replacement surgery is a straightforward series of procedures. A doctor will evaluate if you are first healthy for the procedure, and then if you have enough healthy hair growing areas to retrieve a sample from. A healthy strip of follicles is taken, usually from the back of the head or behind the ears. The skin is then carefully cut to preserve the natural groupings of follicles, and these groups are carefully broken up and transplanted into incisions in the bald area. There are variations on the procedure in which individual groupings of follicles are extracted instead of strip, or in which entire stripes instead of cuttings are transplanted. Depending on the extent of baldness and overall goal for the procedure, the cost for hair transplant can run anywhere from $2,000 to $14,000 per session. Any surgeon that offers these services for less than $2,000 should be reconsidered and questioned. It is an in depth procedure that requires a lot of skill to do correctly. Botched procedures or poorly executed plans can result in appearances that are often cited as being worse than bald. For many though, using a trusted surgeon for hair replacement is considered one of the best hair treatment for men today. It is one type of medical procedure that has been in practice for nearly a century and new technologies and techniques are constantly being developed to improve its success and reduce the costs to make it more widely available. Treatment for men’s hair loss has come a long way. From the Viking’s method that involved smearing all manner of mixtures, often involving the excrement of some animal, to today’s modern medications and procedures, treating male pattern baldness has come a long way. Science has found the leading causes for hair loss and has been able to focus on medications to treat internal conditions, as well as what to focus on external factors that could be affecting proper hair growth. It does not take a lot of fancy or overly expensive “snake oil” creams and shampoos to properly treat hair loss. Both men and women have medications that can effectively reduce and reserve balding. Testing done by your doctor or dermatologist can help pinpoint your exact cause of hair loss and help you tailor the most effective treatment plan. The biggest reason that people are often lured into buying unsuccessful alternative treatments is the promise that they will work quickly and dramatically. True and lasting hair regrowth can take months, or even years. There are some things that you can do to improve the look of hair as it regrows. Tips to improve the look of regrown hair. A lot of patients who use treatments such as minoxidil to help regrow lost hair have found that coloring it can help improve the appearance by making it seem fuller than what it may be. Often times, hair that has been missing for a while will be finer when it first regrows. Hair dye in certain varieties can help improve the appearance of fine hair. For men, it is not hard to find hair dyes to match natural tone that can be used at home. Barbers can also help color or recommend good places to have it professionally done as well.